Hulled roasted pumpkin seed, spicy pumpkin seed with garlic, cayenne, and imported tamari, raw sunflower seeds, dried cranberries, raisins, and blueberries for an exceptionally pleasing snack. 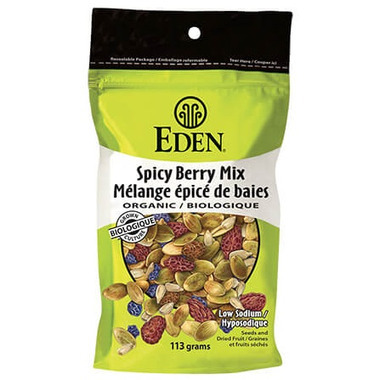 The all Eden organic ingredients provide great taste, superb nourishment, and deep satisfaction. Garlic and cayenne for efficacy and refreshing character. A 4 oz. reclosable pouch for home, school, work, or when traveling. Sprinkle on salads, cooked grain, and thick soup. A good source of zinc, magnesium, and iron. Very low sodium and gluten free.